This condo has 4 levels, 3 of them have living areas with TV, couches and full bathrooms. The main floor has an exterior deck with a screened in porch and there is a gas grill outside for your use. You can walk to outlets, restaurants and more. 5 minutes to Cranmore mountain, 15 minutes to Storyland and only 1-mile to the train station where you can take scenic train rides. There is an on-site outdoor pool. Must see pictures! Bathroom on the main floor has 2 sinks, the other 2 bathrooms have 1 sink. Three generations came together for a week-long vacation at this condo --- and, by the end of the week we all still liked each other! The condo felt spacious and comfortable, even with our large group. The kitchen had plenty of dishes, the dining area and living room had plenty of seating. Clean, bright, great layout. Convenient location to downtown North Conway and all of the D'Angelos sandwiches you could ever dream of. The condo owners were very nice and easy to communicate with. Thank you for sharing your property with us --- I hope we can come back next year! We spent a memorable family get together in this lovely house. The place has everything a large group needs to enjoy a fun and relaxing vacation, and more. We were five families, a total of15, and were as comfortable as it gets . The house is located in a quite surrounding and minutes away from many stores. The house was clean and neat and kitchen was well equipped. Tom (Owner) is a very responsible person and responds to all our calls right away. We all really enjoyed our stay and highly recommend this house. Thanks for being a great guest! Roomy condo, great for a large family or multiple families. Pool was a fantastic feature as well! 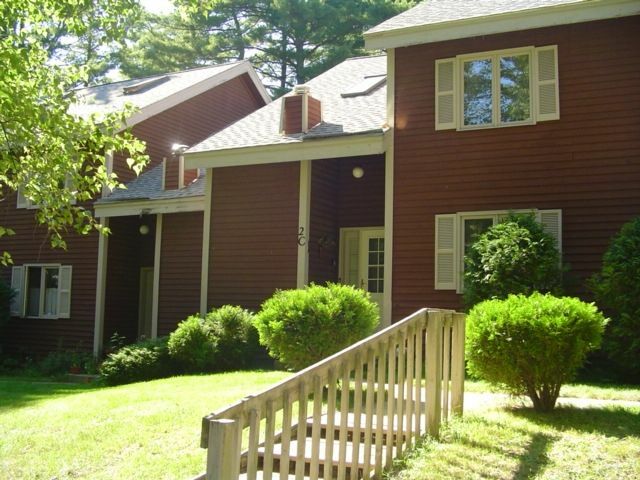 We've been going to North Conway for several summers in a row, but this was the first time we stayed in this condo - and we probably won't stay anywhere else. This condo was within walking distance to the outlets and many restaurants. There was plenty of space for us to spread out without feeling cramped. Air conditioning throughout the condo was a great bonus. Tom was always quick to respond to any questions that I had. We can't wait to come back next year! The condo is run down & tired looking. The sheets & towels were thin & worn out. The carpets need a major cleaning or replacing. The kitchen & bathroom floors were sticky. Bring slippers because you won't want to go barefoot! The mattresses are old & so are the pillows. We found North Conway and it's restaurants & residents delightful. We have been renting our condo for 8 years and this is the first negative response we have gotten. The carpets were replaced 3 years ago along with all new kitchen and bathroom tile. We have a cleaning service who cleans the unit each time and changes all the sheets and towels for each new renter. Though I feel this review is out of line, I will address each issue.